According to the battery manufacturers, a battery should be charged with only 1/10 current (in ampere), of its Ah value. For example, if a battery is of 7Ah value, then it should be charged with 0.7 Ampere current. Charging a battery using this rule, extends the battery life. Charging current is controlled by T1, R1, and R4. VR1 is used to set the charging current. As the battery gets charged, the current flowing through the R1 increases. This result in increase in the current and voltage from the LM317. When the battery becomes fully charged, charger reduces the charging current to the battery, and the battery is charged in trickle charging mode. The input at LM317 should be around 3 volts higher than the output voltage from the LM317. 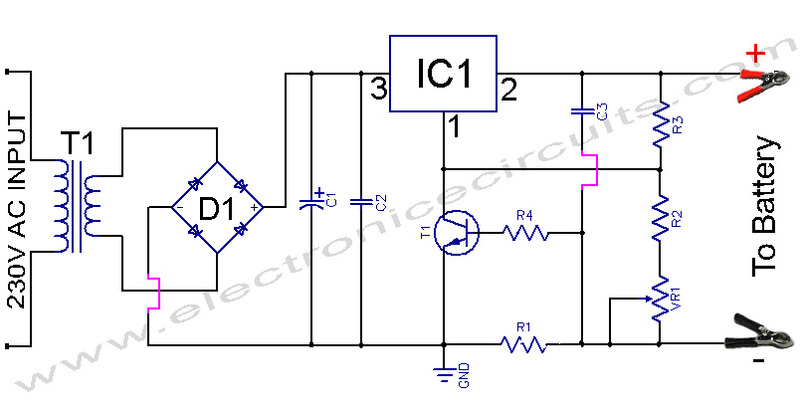 As this IC requires minimum 3-volts for its operation. As this IC gets very hot during operation, a good heat sink should be used with this IC. i think it would be more clear if you explain the working of T1,R1,R4 as current limitors. When the battery is connected, current flows through R1 and Voltage is drops accross it. 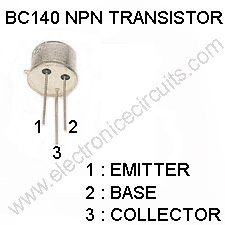 This voltage now becomes the base voltage for the transistor, if this voltage exceeds about 0.7 volts, the transistor turns on and reduces the output voltage of the regulator which also reduces the charging current. Note that the higher the output voltage above the battery, the higher the charging current and the lower the output voltage of the regulator above the battery voltage, the lower the charging current. Hope this helps a little. Can u explain it in more detail? And how can we add charging indicator for low charge and full charge indication? I like kill and will likely build it. Right, this is usefull for SLA charge long time without broken. because T1-BC140 will be open close-up, it’s protect over current for LM317 at full-charge, that’s meaning limited current for SLA battery. add diode (1N4007) input and out put to wrong plug-in power pole. Thanks for posting this circuit. It’s a great reference. How can I calculate the max charging current using VR1? Pl correct me if I am wrong . Have seen this ckt or its variation in s many places could not help saying these words . The above is a simple ckt . The function of R1 and T1 is simply to cut off by limiting any excess current to the extent of 0.6/R1. Where 0.6 is the eB drop of the transistor. The theory being , when the drop across R1 is More than 0.6v, the Tr conducts and brings the ADJ terminal to, or near ground cutting of the current to the battery. So the current is limited to1.07A. If it tries to exceed , it will be brought to zero or near zero.